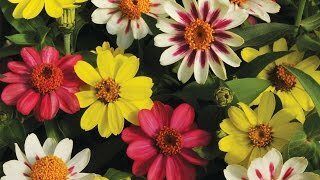 Our superb crested types are a well-balanced mix of early, continuously blooming yellow, gold, red and orange 2" blossoms. Marigold may be grown from seed sown early indoors and transplanted outside after frost, or sown directly in the garden after frost, or from potted plants. Direct sow seeds in average soil in full sun after all danger of frost. In frost free areas, sow from fall to early spring. In the Deep South, a spot that receives shade during the afternoon helps protect plants from excessive heat. Sow seeds about 6 inches apart and cover with ¼ inch of fine soil. Thin plants to stand 9-12 inches when seedlings are 1 inch high. Select a location in full sun with good rich, moist, well drained organic soil. In the deep South, a spot that receives shade during the afternoon helps protect plants from excessive heat. Set level with the surrounding soil. Fill with soil to the top of the root ball. Press soil down firmly with your hand leaving a slight depression around the plant to hold water. Keep plants well-watered during the growing season, especially during dry spells. Watering during dry spells will improve flowering--although it will produce lots of succulent leaves. Deadhead marigolds to keep them flowering from late spring until frost. Add marigolds to sunny beds, borders and containers. Plant marigolds with both sun-loving annuals and perennials in your garden. Marigolds combine well with lavenders, salvias or sages, cosmos, daylilies, coreopsis, and nasturtium. Marigolds are frequently planted among vegetable crops to prevent pest and disease problems. Many shorter marigold varieties are great for containers. Marigold, Boy O' Boy Mix is rated 4.5 out of 5 by 6. Rated 5 out of 5 by Mile High Gardner from Great! I gave these a bad review earlier in the summer, but I regret it it! The flowers take a little time to reach their full potential, but one they do, they are amazing! The flowers have lots of petals and look exactly like the picture on the website! Mine grew to 15", which is higher than stated on the website, but that is just a bonus! At one point, there were so many flowers, I could barley see the leaves! If you are buying these, make sure to snip the dead blooms off so blooming continues. Rated 2 out of 5 by Mile High Gardner from Small I bought the seeds online and planted them in my raised bed, but the blooms are small and only have a few petals. They look very different from the picture online. Rated 5 out of 5 by sunflowerlover from I planted these last year and they grow great! They grew nicely. But Burpee might want to adjust there height limit on this product, because mine grew to 12 inches! I will plant these next year. Rated 5 out of 5 by blossombrigade from Easy & Pretty I grew these in tiny pots so they stayed small, but very cute! Required little care and had great color. Rated 5 out of 5 by dohm from I have grown these for several years and they do not disappoint. They are exceptionally easy to grow (just throw them down and cover with a little dirt) and do not mind if the watering is a little erratic. The plant are bushy and make tons of flowers. I have deadheaded them into the flower bed and many times they come back up the next year.